I just want to let all the folks at home in the US know that we were well taken care of on Thanksgiving. The food was abundant and fantastic, as it should be on this Holiday. And the dessert table (hidden here and shown in Julie’s and David’s blog) was magnificent. Most of the decorations were carved food like the flowers, that are actually carrots and beets amongst other unidentified veggies. 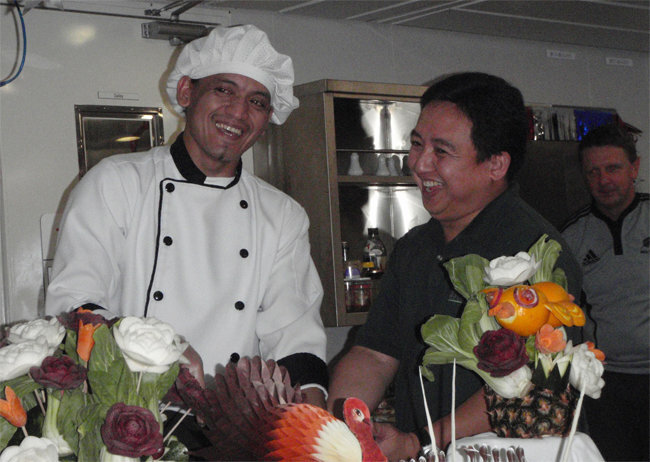 In fact, the gentlemen in this photo have been serving us all kinds of culinary delights from the time we arrived. They serve 4 meals a day and always with a smile. There is always something for everyone. The JR is a very friendly, can-do, place for a scientist to work. And that seems to true for the crew and staff as well. I hear that some members of the crew have served on the JR (and presumably her predecessor, the Glomar Challenger) since she first began sailing as a science vessel under the DSDP program some 30 years ago.